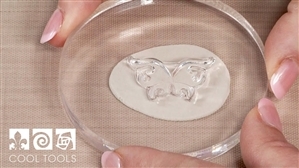 Jewel Stamps are crystal clear, designer images made for creating in jewelry clays of all kinds. Impress beautifully designed, laser sharp images in metal clay, polymer clay, porcelain, and other soft clays. Jewel Stamps are made of a durable, flexible, washable polymer for years of use when handled properly. Each 4" x 6" Jewel Stamp set has five designs and 3 sizes. We also have words and phrases. Create keep-sake jewelry with customizable designs with ease. If you are interested in Jewel Stamps, please click this link: Products Used and scroll to the lower section of the page. Jewel Stamps - Filigree Squares 1 Metal Clay Round Work Surface - Acrylic 3" x 1/8" Jewel Stamps - Filigree Squares 2 Cool Tools Clayboard Non-Stick Work Surface 9" x 9"